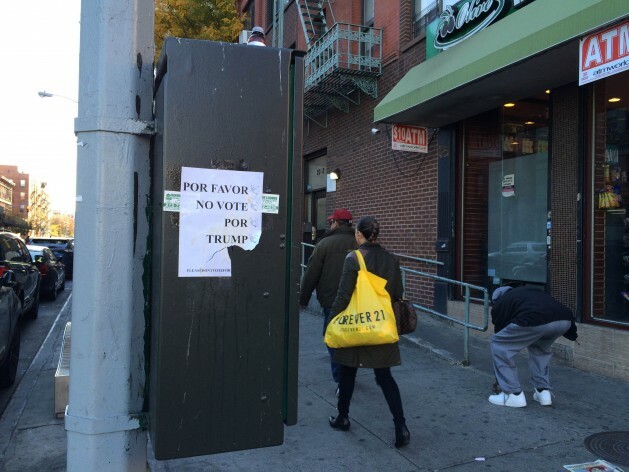 Signs in East Harlem, New York, an area with a high Hispanic population ask voters not to vote for Republican candidate Donald Trump. Credit: Lyndal Rowlands / IPS. In one voting location in Cincinnati, Ohio as many as 4000 people stood in a line over half a mile long waiting to vote, according to Twitter user Saahil Desai. High voter turnout should be considered as a public good, Massimo Tommasoli Permanent Observer for International Institute for Democracy and Electoral Assistance (IDEA) to the UN told IPS. “In general, it is a public good to have a high level of participation because normally this is something that reflects higher levels of inclusion, it addresses typical exclusion, segmentation of a country,” although he noted that it is not always a priority for politicians who would rather focus on inspiring their own supporters to vote. The closeness of the 2016 US Presidential election has sparked questions about electoral integrity and voter participation. One way that electoral integrity can be assured is through international observation. The 2016 US Presidential election is being observed by an international Election Observation Mission from the Organization for Security and Cooperation in Europe (OSCE) Office for Democratic Institutions and Human Rights. “In general, it is a public good to have a high level of participation because normally this is something that reflects higher levels of inclusion" -- Massimo Tommasoli. However, although the U.S. government invited the international observation mission, 13 U.S. states — Alabama, Alaska, Arizona, Connecticut, Hawaii, Louisiana, Mississippi, North Carolina, Ohio, Oklahoma, Tennessee, Texas, West Virginia — explicitly forbid international observers. One of these states, North Carolina – a so-called “swing state”, has been the subject of particular scrutiny in the days leading up to the election. On Thursday 11 November, a federal judge issued a restraining order to stop state and county election boards in North Carolina from “mass purging” voters from its electoral rolls. The mass purging had begun after electoral boards began illegally removing voters from the roll after a single letter from their home address was returned to sender. “The NAACP is defending rights of all North Carolinians to participate in this election and we will not back down and allow this suppression to continue,” said the Reverend William Barber II, president of the North Carolina NAACP in a statement. Considering that the U.S. Presidential election between Republican George Bush and Democrat Al Gore in the year 2000 was decided by a margin of only 537 votes in Bush’s favour in the State of Florida, even small changes in state election rules and regulations could potentially have a significant impact. Another way that participation in US elections is limited is through voter ID laws. Stricter voter ID laws are usually favoured by Republicans or conservatives, he said, noting that other elements of a working electoral system include voter registration and voter education. Overall, Tommasoli said that “voter turnout in the U.S. is traditionally very low compared to other countries” but that Tuesday may bring a higher turnout than usual due to the polarisation of the election. The United States Election Project predicted Monday that 135 million people would vote in the 2016 election, higher than the 2008 election when President Barack Obama was first elected.